Gain a quick understanding of what our Editorial Team can and cannot fix or change in your article. How far-reaching is the power of an EzineArticles Editor? Do you need to be concerned that they may change the actual content of your article? The answer is no. As a matter of fact, there are many limitations on just what an editor can change. 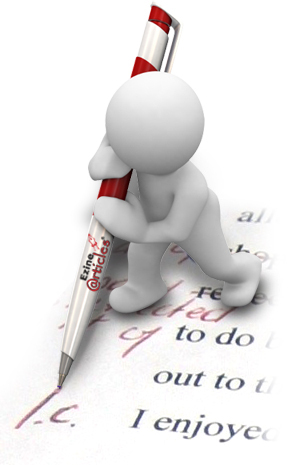 And those changes are designed to only improve the grammatical, structural and readability qualities of your articles. Punctuation– Editors can fix or add punctuation and tweak minor errors in the wording within an article. Spelling – Editors are expected to make sure that all the words in an article are spelled properly. Common Usage Errors – Editors must look out for frequent author word misuse such as “loose” and “lose”, “their” and “there”, or “your” and “you’re”. Minor Sentence Structure – Editors may also change the punctuation in sentences by adding commas, periods, and capitalizing words. For example, an editor may break a run on sentence into two sentences by adding a period and capitalizing the next word. Editors may NOT move the pieces of a sentence around or take out content to make it sound better. Minor Words – Editors can change only minor words within an article title or body. For example, it is okay to add or remove a “the” or “a”. It is also permissible to change a word to the correct tense. Formatting – Editors ensure that the article is attractive and easy to read – articles should be in paragraphs and have proper spacing/bullet points. Content or meaning of a title or article. “Content” is the informative or creative material that authors submit in their articles. For example, if the article’s title is “5 Tips for Buying a Home” and the author lists 7 tips, the editor CANNOT take out the 5 and replace it with a 7. That would be changing content by taking it away. Now if the same title said “5 Tips for Buying Home”, the editor CAN add the word “a” to make it grammatically correct. Major Sentence Stucture – Editors are also not allowed to take out parts of the article or change sentence structure around. Major Words – Editors may not take out words or sections of a title or article. Title Word Order – Editors cannot change the word order in an article title. Our editors are typically not allowed to remove content – though sometimes editors can move minor items around, such as reposition a copyright to the bottom of the article. Essentially, the content of your article will always remain the same. An editor changing content within your articles is considered taboo here at EzineArticles. We understand that you are entrusting us with your material and we want to validate that trust by never overstepping our editorial boundaries. Our job is to make you look good. Poor quality articles will not only slow down the review process, they will also flag you as a less-than-ideal author. Repeat quality offenders can have their accounts downgraded, suspended or removed from the site. So take the extra time to ensure that your article is as good as it can be before hitting that “Submit” button and we’ll do our part to double-check your work before it gets published on EzineArticles.com. When in doubt, consult the Editorial Guidelines. When I first saw this I wondered if I had done anything improper. I’m guessing not or at least not any grievous error. What I am wondering is whether authors are notified of changes that the editors make; does that happen? I have never received any feedback, but that would be a great learning tool for us and hopefully make the editor’s job easier in the future. We feared even sharing today’s blog post with hopes that our members wouldn’t begin to lean on us as their Editorial department. Some day we may develop a Premium level of service that will include full editorial service. Until then, we’re not setup to notify you when we make minor edits to improve your articles. One way to track it if you’d like is to save a copy of your original article in a word doc; Grab the final approved article after it goes live and do a merge/compare to highlight any differences. I had anticipated your answer, but you never know until you ask. I will start doing that with my articles so I can improve my editing ability and hopefully reduce the load on your editors. Do you have any articles in your archive about how to select the proper title? I feel that I am failing to attract attention to some articles because the title is not attention grabbing. Can you point us in the direction of articles or blog comments that can help us increase the clicks to our profile and my links? What is the best way to attract an emagazine or even regular magazine to EzineArticles? Do you have any experience as to whether that even happens? Is there a restriction on my ability to publish my articles in places other then EzineArticles if I have them published here? If I have something on my blog can I cut and paste it unchanged into an article and vice versa? You guys are awesome and I really appreciate this opportunity. Attn grabbing is 2nd to making sure you have a primary and secondary keyword in your article title that directly relates to a benefit or a promise of a benefit your article body will deliver on. You can submit articles to us that you own and wrote even if you have them published elsewhere. We only require that your articles are unique to you …which means we must not be able to find your articles elsewhere on the Internet under no name or someone else’s name. One thing I would add to Chris’ response is to use the power of our blog search to get your questions answered. If you look in the upper right corner of the blog page, you’ll see a Search field right below Christopher’s smiling face. That search is restricted to just the blog – so you can use it to quickly find posts on all of your questions, both present and future. I wonder if other authors are as gulity as I am of telling you thank you for a job well done. Any minor changes ever made to any of my articles made it better and I am grateful for your care. Do You know the Mchesney clan? I’m new here and wondered how long it takes for Our articles to be approved. Also do we get a chance to make adjustments one is NOT approved? Basic members have a 7-9 day wait, Platinum members are have a 1-3 day wait, and Premium members are same or next day. This is not normal as we’re at about 2-3x slower than our target review speed and know we’re working hard to eliminate that gap. If your article can be saved, you’ll receive a problem email explanation along with a request to make corrections. If you never hear from us, that means we may have determined that your article can’t be saved under any circumstance. Before thinking you’re in the latter category, if you’re not Platinum yet, give the process a few weeks. Remember, ever article is human reviewed by two different Editors…1st Editor and QC Editor. I once had a title that EzineArticles added commas to. I wanted the title, but didn’t know how to separate the words and make it look good. I was grateful to EzineArticles and have never created a title as such again. That is a real weak-spot with me…coming up with good titles. Lately, I have been titling my articles first and then writing them, instead of the other way around. Anyway, thanks EzineArticles for all that you do! What boggles my mind is the sheer influx of articles on a daily basis and how the Editors are able to keep up with this demand. I say give them a bonus for a splendid job and their editorial power. Not to talk about EzineArticles, with now over, 200,000 authors. Thanks for the great information. Until reading this article, I didn’t know that EzineArticles editors make cosmetic changes to our articles. I’m grateful for your expertise! Wow, I had no idea you were even doing that much, cool! Keep up the great work there. WOW, I am majorly impressed. Thanks for the information. I already like the spell check it does with the preview tool. I think one of the benefits to authors are the guidelines and ongoing training for article writing. That the basic thing EzineArticles can improve.. But it still helpful for non-nature English speaker like me. I didn’t realise that you did edit articles, but then when I thought about it I thought that’s fine by me. I think everyone can make minor mistakes even the best writers so having it tweaked and approved rather than rejected meets everyone’s objective as far as I am concerned. Good to know. Do the editors change article categories or is that automated in some way? I have noticed a few times my articles were placed in a different (but more appropriate) category than I had originally chosen. Sometimes it’s difficult to choose if you feel the article could fit easily in one or more category. We will change the category only if what you have chosen is not a fit. I think at times authors tend to pick the category that is best suited to their niche or website and build that habit. When they write about something else, they forget to change the category as old habits die hard. We review every category in every article to make sure it fits. If it doesn’t match, we will change it for you. Mine were just things like switching it from “writing” to the more specific “writing articles” or “gaming” to “online gaming”. One on car leasing was moved from an automotive category to “leasing” so any I submitted after that, I took the editor’s lead and put in leasing instead. But you’ve given good tips for us all to keep in mind. Thanks again! I didn’t realize the articles went through an editing process at all. Something I always try to remember to do with my own articles/website content, etc, is to read it outloud. You can usually spot a lot of errors that you may just skip over when reading in your head if you just read it out loud. And I agree with the above sentiment. Thank you so much for all your hard work to make us look good and ensure you have high quality articles in your directory. I must admit I have wondered from time to time whether you ever do any minor editing. Now I know. I think I take a lot of care before submitting an article-using spellcheck, and reading it all through a number of times for instance-but there must be times when something unintentional slips through. So, I for one am very grateful for any help you may give by making any needed corrections on (hopefully) the rare occasion. Thanks.